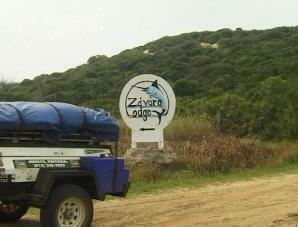 Zavora Lodge is situated about 100km south of Inhambane and is set high on the dunes overlooking the magnificent Bay of Praia de Zavora. Zavora has excellent sheltered snorkeling and fishing all year round and the launching of ski-boats and rubber ducks is made easy due to the protected bay. Meals of your choice are prepared on request and served under the shade of the coconut frond bar overlooking the ocean. The lodge also boasts a well-stocked pub where you can enjoy an ice-cold beer whilst savoring the beauty of the bay and coastline. 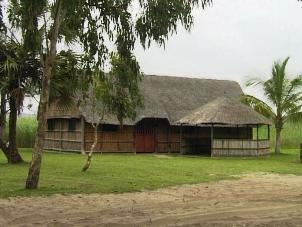 Accommodation consist of 4 four bedded thatched bungalows and a six sleeper bungalow adjacent to the camping ground. These bungalows are not on-suite but each has its own outside ablution unit with shower, basin and flush toilet. Each bungalow has an open plan kitchen with gas cooker and utensils. The lodge also boasts two houses on the dune overlooking the bay, one six bed and one eight bed unit. The camping ground is set behind the dune a short walk from the beach, and boasts some baracas, that can be used for a kitchen or living area.